Searching for homes in Manhattan Beach can be pretty stressful at times. When there's very little inventory to choose from and when it seems like 1/3 of the Manhattan Beach real estate deals are happening off-market, one really needs to step up their game. Here are 5 useful tips to help you get your ducks in a row so when you find the right one, you'll be ready to pull the trigger. It may sound simple, but narrowing down what you need in a new home, as opposed to what you want, can save you a whole lot of time and energy during the house hunting process. Chances are you'll never find a home that checks off all the boxes on your wish list, so understanding what you NEED is a great first step in finding a place you can be happy with! As one of the top beach cities in Southern California, Manhattan Beach features a variety of housing styles and locations that all offer something different. So before beginning your house hunt, get to know all the different Manhattan Beach neighborhoods or narrow down your options by using our Advanced Search. As mentioned above, sold comps can certainly help determine whether or not an asking price is fair. But along with that, using sold data can also ensure you make a smart offer on a home that makes sense for both parties. The last thing you want to do is offend a home seller or possibly spend more money than necessary, so using all information available to you is an essential part of buying a home! So whether you're looking to buy or looking to sell, get a free market analysis today! Working closely with a professional Manhattan Beach real estate agent has many advantages. 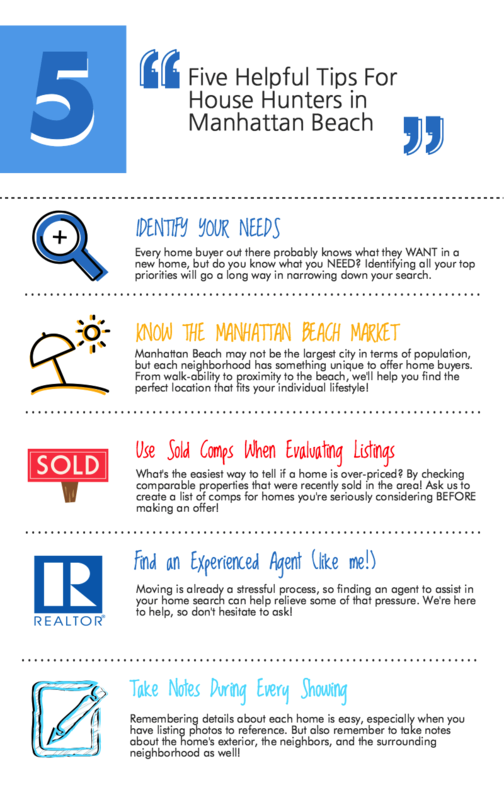 Along with scouring the market for possible listings to view, an agent can coordinate showings, research comparable properties, help determine an apporpriate offer, negotiate with the seller directly, and guide you all the way through the home buying process, ultimately saving you plenty of time and money in many instances! When viewing a potential home in person for the first time, there's a lot to take in. Listing photos don't always tell the whole story, so don't be afraid to take detailed notes during each showing. What kind of condition is the home in? What are the neighbors like? Is there enough storage space? how is the traffic outside? How is the neighborhood vibe? The list of questions can go on and on, which is why it is important to jot down your thoughts about each property you view!